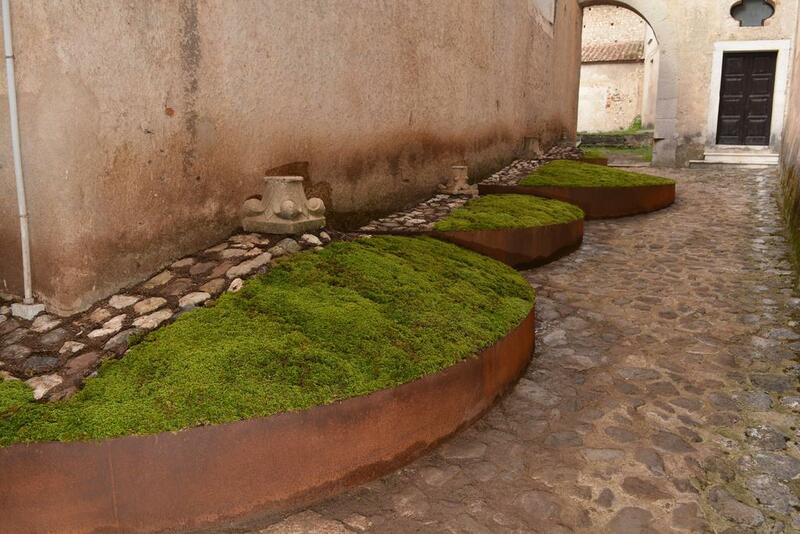 Materials: EPHEMERAL INTERVENTION: stone ruins, cor-ten steel plates, earth, ears of wheat, Limonium flowers, sound, perfumed essences. 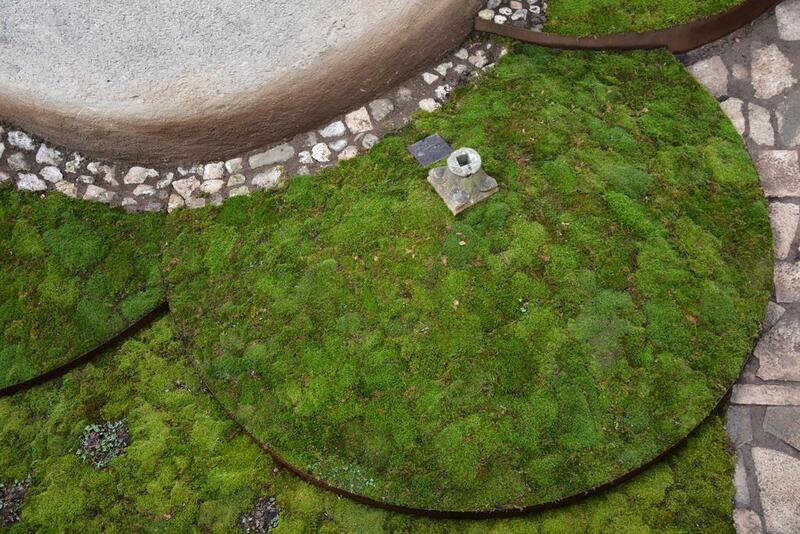 PERMANENT INTERVENTION: stone ruins, cor-ten steel plates, earth, musk (Bryophyte), Cyclamens, sound, perfumed essences. Dimensions: m 39 x 5 x h 3.5 - m 21 x 5 x h 1,5. 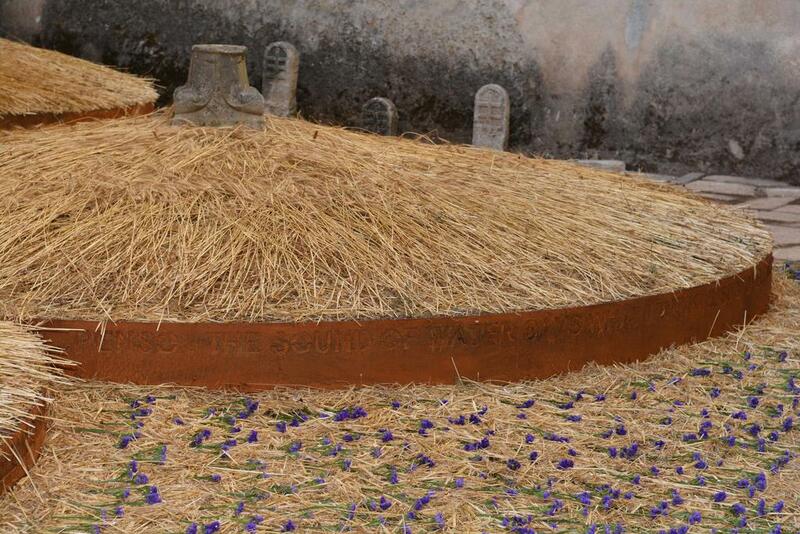 Maria Dompè, due to functional reasons, created a suggestive double visual presentation at the event of the “Il Cammino delle Certose:” an ephemeral display with a bucolic setting with ears of wheat and cut flowers of Limonium (inspired by the ancient use of the area as granary court) and a permanent display with a planting of moss (Bryophyte) which is interspersed by the addition of the intense chromatic colors of cyclamen flowers (Cyclamen), transforming , definitively, the installation into a real artist’s garden. 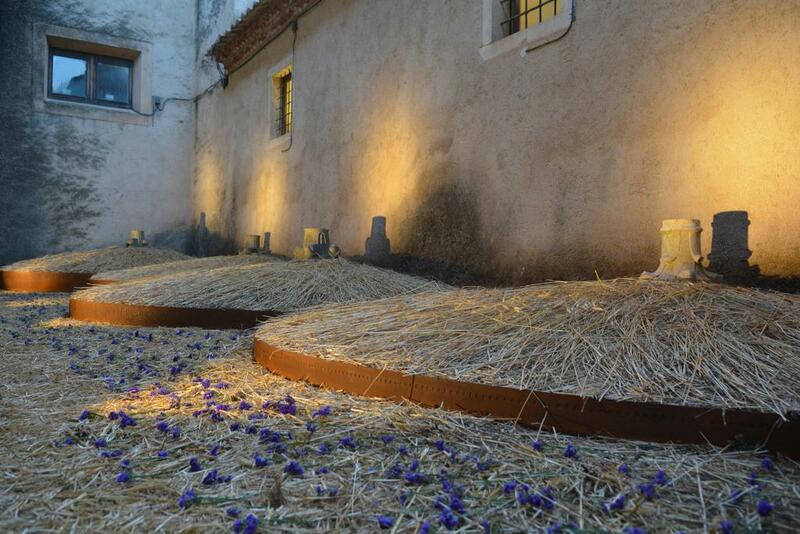 An interesting, as well as unprecedented, artistic proposal with a double value, that is a transformed scenography where nature dominates the stage with a meditated affinity with the place and the pervading contemplative energy. 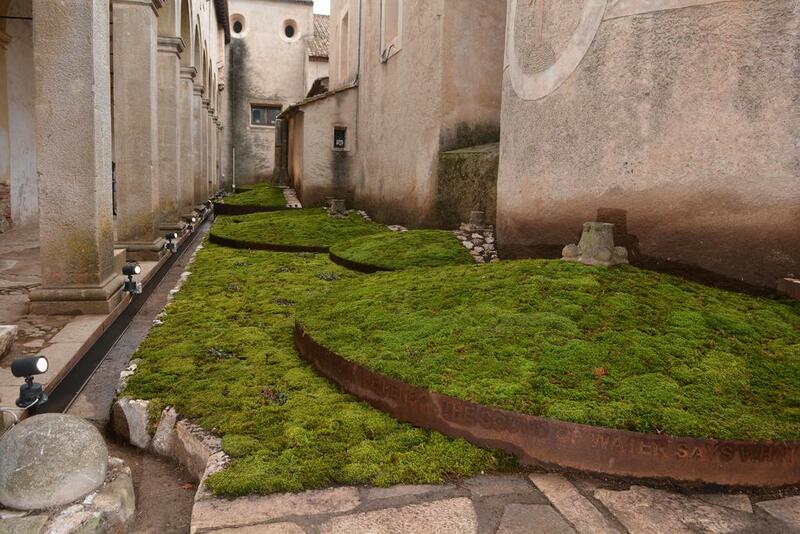 Dompè’s “sculptural gardens” are enveloping itineraries in a single expressive, intimate and spiritual territory. They inhabit places in a suggestive harmony with the surrounding area, amplifying their historicity and involving the visitor in an emotional and sensorial embrace. The artist, with acute sensitivity, perceives the historical sedimentation of the area, tracing the borders of an uninterrupted dialogue between present and past. The current vision of this fruitful journey is inside the magnificent monastic buildings of the Certosa di San Lorenzo (UNESCO patrimony site) near the village of Padula in the Campania region (Italy). “A magnificent context steeped in spirituality where the ascetic matrix transcends every single artifact, transforming itself into poetry of the soul,” says the artist in her own exalted words. 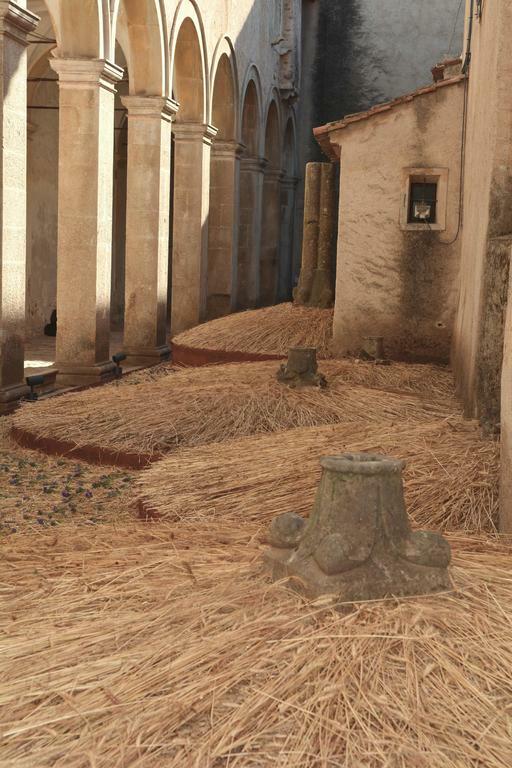 The artist has chosen the site, discovered the recondite corner, hidden to visitors (an unused and neglected area), and she has reshaped it and revitalized it. 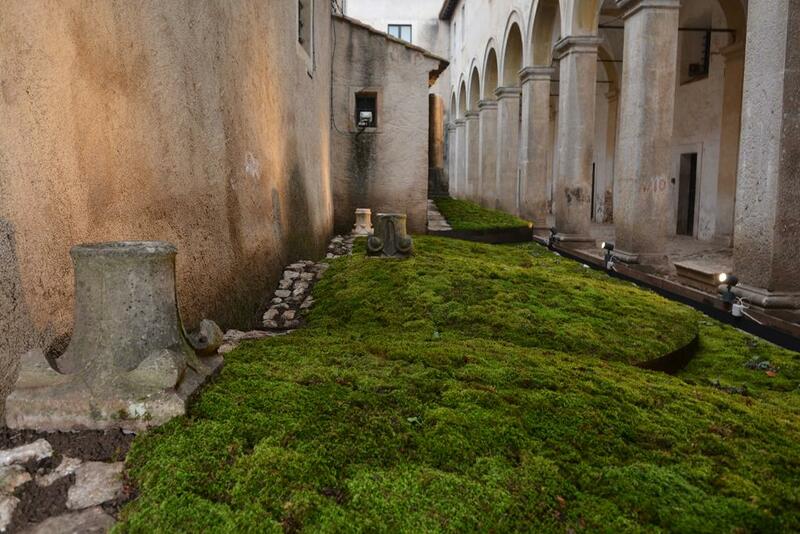 By researching and valuing the native stone elements with artistic sensitivity, the artist has created what is perhaps the first public moss garden in Italy: an artistic message in solidarity with Nature. ALTUM SILENTIUM is the title of this green work, designed with simple lines creating a hieratic representation that captures the essence of the cenobitic monasticism of the religious community. The historical affinity is accentuated by the use, within the installation, of ancient vestiges of ruins. Thirteen exquisitely made capitals and an imposing fragment of a column are placed at the apex of each single circle making up the overall design. 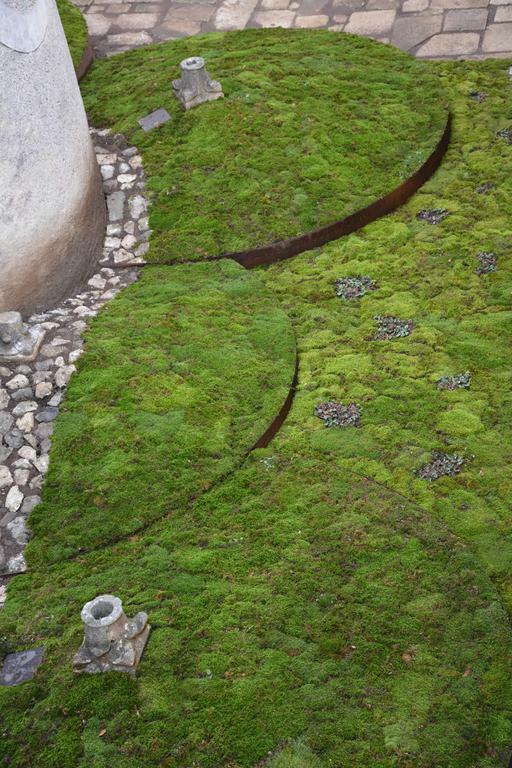 This placement is deliberately inverted in respect to classical architectural use; the intention is to enhance the earth-sky connection or to serve as metaphor of spiritual elevation. Even the central disposition of the single column is confusing, reversing the usual architectural paradigm, also symbolically adapted to the speculative search for ascetic verticality. From the earthly platform, man with the help of nature, understood as the foundation of the divine plan, rises into a spiritual transcendence to heaven. Even the central disposition of the single column is disorientating, reversing the typical architectural paradigm, also symbolically adapted to the speculative search for a monastic, ascetic verticality. From the earthly platform, man, with the help of nature, which is understood as the foundation of the divine plan, rises into a spiritual transcendence to the heavens. The work proposes a circular movement that is repeated more times, outlined by curved and engraved metal plates, with a purposely emblematic pattern. The design revokes ancient symbolism in which the circle has many meanings and values: from the connection with the divine, to the completion of the cycle of awareness. In classical iconography it is often associated with the sky, with the celestial dimension, representing the cosmic design par excellence. In a broad sense, however, it is a representation of the spiritual world that must offer meaning and order to life. 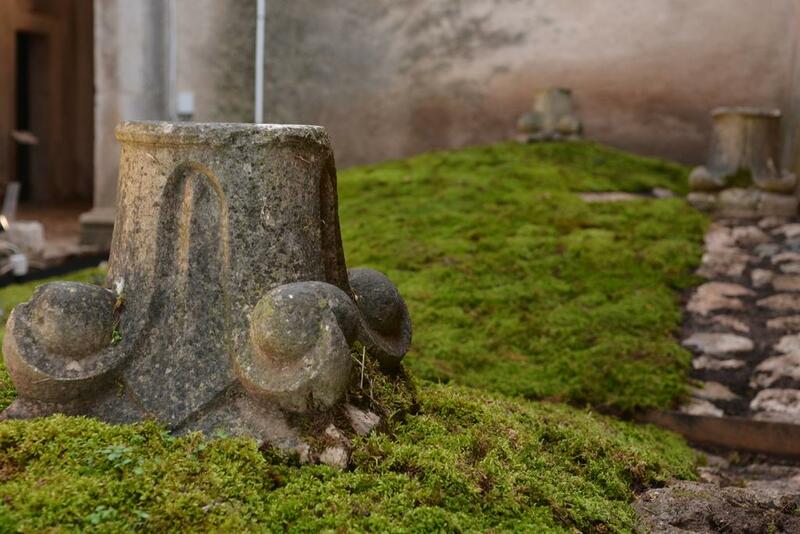 The artist’s garden: ALTUM SILETIUM is dedicated to the Carthusian monks and to the vow of absolute silence that this monastic order must practice as a process of purification that leads to mystical fulfillment. 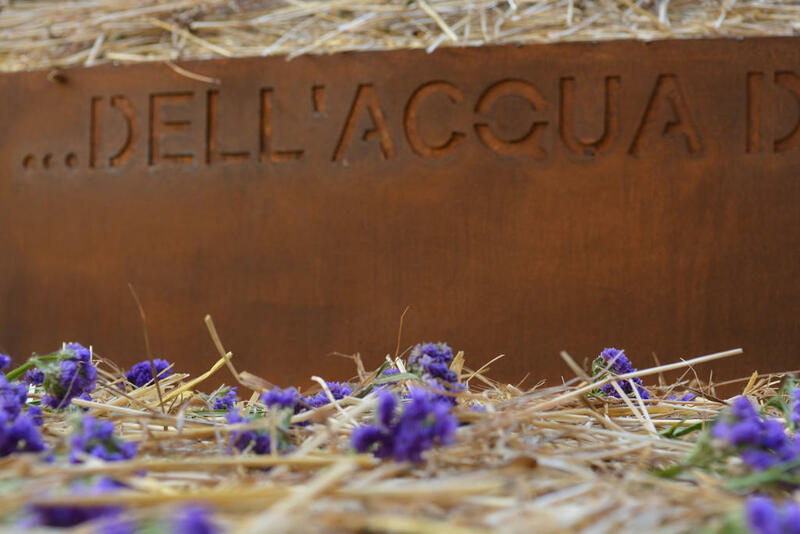 The words engraved in the circular metal plates evoke the mantric sound of the water, audible in ancient times in the Certosa from the hundreds of fountains that then existed, and now re-proposed by the artist with musical sounds of specific cadences that can be heard during the visit. 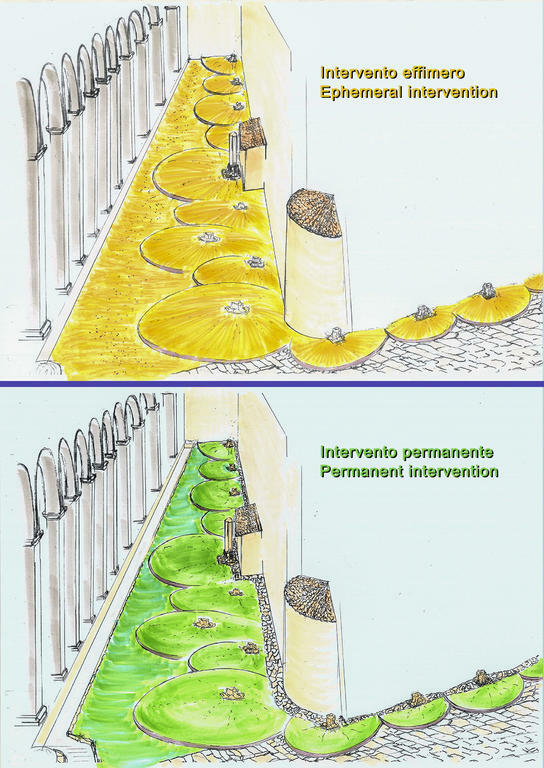 The sensory path is accompanied by the dispersion of aromatic essences. 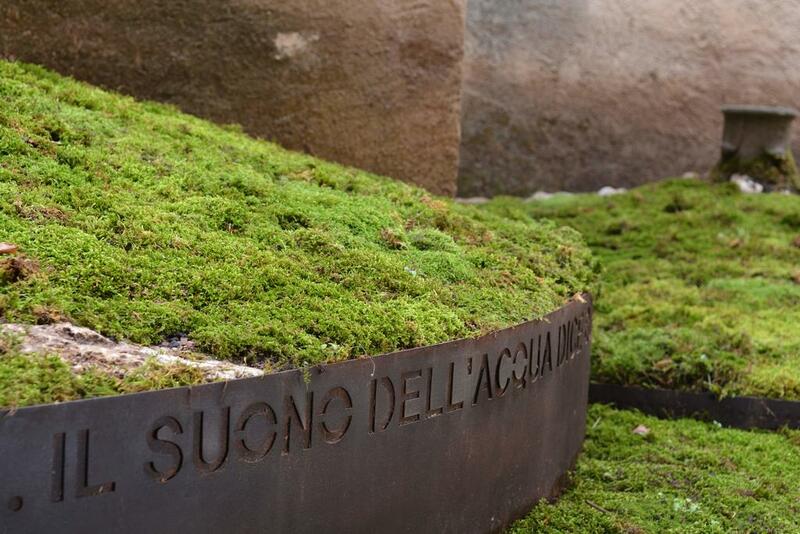 The engraved quotation: “il suono dell’acqua dice quell che penso – the sound of water says what I think . . .” is taken from the writings of Chuang-tzu.